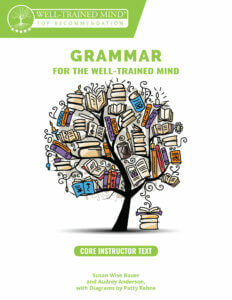 Grammar for the Well-Trained Mind is a four-year grammar program designed for students fifth grade and above. New students may take more than one year to get through their first Workbook. Once a student has completed all four workbooks in our program, they will have all of the grammar knowledge that they need to go on to the study of rhetoric, the application of grammar to written and spoken words. Each year, you will use the same Core Instructor Text, which has all of the lessons you will be teaching the student. Each year, you will use a different Workbook (containing student exercises) and Key (containing answers and explanations). There will be four Workbooks, along with their corresponding Keys, each named after the color of the cover. The Purple Workbook, for instance, used to be titled Student Workbook Year 1. The Key to Purple Workbook used to be titled Key to Student Workbook 1. We recently changed the names of our Workbooks and Keys because the original names implied that these Workbooks must be gone through sequentially. In reality, it does not matter what Workbook you start your instruction with, since each workbook covers the exact same rules and examples. The exercises change in each workbook – but only in content, not in intensity. The Student Workbooks do not build on each other. Each one can be used independently, at any time during the course of your study. You can begin this grammar program with any Workbook and corresponding Key because our program is based on the three essential things that have to happen in order for students’ minds to really comprehend grammar: repetition, memorization, and practice. We use the same Core Instructor Text every year so you can use the same words to explain the grammar concepts to the student each year. The same rules, the same examples, every single year. That repetition will help build the information and solidify it in the student’s mind. So the first thing is just memorizing the rules. Second, whenever you memorize a grammar rule, because grammar is something that governs the way real language works, you need an actual example. So every year the student repeats the same examples that illustrate the rules. That way they always have a concrete example of how the rule works to link to the actual memorized rule in their brain. The third thing the student needs after this repetition of rules and examples is practice. So although each Workbook has the same rules and the same examples for every year, each one also has a full new set of exercises for the student to practice on. Again, because these exercises only differ in content, not in intensity, you and your student can start the program with any Workbook and corresponding Key combination. We hope this explanation helps you and your student as you explore Grammar for the Well-Trained Mind! Is there any way to see samples of this curriculum? I loved first language lessons but at 5th grade I had to choose something else so we started using Rod & Staff. I’m really happy with it although by DD does not like doing it. I’m curious if I will keep her in R&S and if I will transition my younger kids the same way. 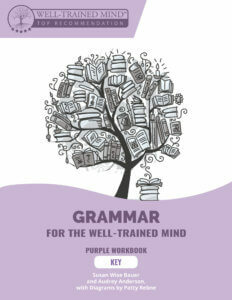 I’d love to compare to these Grammar workbooks. I’m looking forward to starting this with my year 5 daughter though we have not yet finished FLL 4. Should we finish this before starting or is it okay to just start on GFTWTM? (We are in AU so her year 5 year has already started). You can start on GFTWTM without having completed FLL 4. GFTWTM starts out with a bit of review. 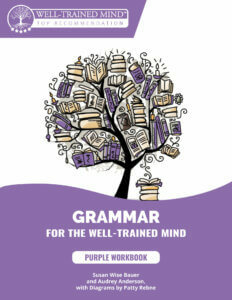 I am seeing only the purple workbook. I thought the article stated it will be a full 4 year program. Are the other books available already? We loved first language lessons, but switched to Saxon grammar because I didn’t see a continuing book. I would like to go back, but if only one workbook is available, I’m worried about the effects of switching back and forth between curriculum. That’s a fair question. Yes, only the Purple Workbook & Key are currently available, but we are hard at work on the next one (Red) and we plan to release it this summer. Thank you for the quick response. I think we’ll give it a try. I am starting homeschool with my 5th grade daughter for the first time. She has been in public school until now – do you recommend starting with this workbook, or the FLL 4 perhaps? My son will be starting 8th grade in the fall. He has been using a different curriculum since 5th grade, but he has been struggling. I am excited to see that you are expanding into higher levels. Would this be appropriate for him? Yes, this curriculum sounds like it would be a good fit for that kind of student. I’m going to begin FLL with my 4th grader and 2nd grader in the fall. At this level I think FLL will be well rounded enough with our usual read aloud times. I’m just curious what the recommendation for reading may be for the 5th year or whatever year we start GFTWTM. I’m not super new to homeschooling, but I am super new to this great method of teaching and learning. I appreciate any guidance you may be able to provide. I’m not sure I understand the question. Are you looking for a Reading curriculum for 5th grade, or a Grammar curriculum for 5th grade? When will the second year be released? We are working on the 2nd year right now, and plan to publish it in the late summer of this year (2018). My son started using this curriculum this year, in eighth grade, and he loved it. We would like to continue with it next year, moving on to the next workbook. Do you recommend this curriculum for high school students? We’re so glad that your son loved it! Yes, it would work well for a high-school student. The next workbook (“Red Workbook”) is scheduled to be released this fall, along with an Answer Key. We have purchased the entire set and have been using them. Great book! We found some errors in the Answer Key. Who should we contact to send these findings? Also, when will the Workbook 2 be out? Can we get a sneak preview? If you find others, you can send them to [email protected]. The 2nd workbook (“Red Workbook”) and its Key should be out this fall. We are planning to release the first few weeks for free as a PDF download. We’ll announce that on our Facebook and Twitter accounts, as well as our email updates.